In the e-liquid industry there are few companies with a better reputation for quality than Element. From their base in sunny California, this US-based e-liquid manufacturer produces an exciting and innovative range of juices to cater to every kind of vaper. In addition to the Element Dripper series, the Element 50/50, Emulsions, Far, NS20 and KOI ranges are all available from the F&S E-Cig website, so feel free to take a look. As the name implies, these juices are formulated with drippers and mechanical mods in mind, with the intention of producing some epic clouds as you vape – as fragrant as they are dense. Whatever your taste buds prefer, they’ll find a soulmate among the Element Dripper series. With flavours ranging from the tangy and the citrus to the sweet and the creamy, with some icy menthol options available too, there is something for everyone here. For any e-liquid manufacturer, getting the base right is just as important as the flavour. That balance between propylene glycol (PG) and vegetable glycerine (VG) in the base liquid is crucial to the finish you want from your juice. Element understands this better than anyone and, with their Element Dripper series they have really nailed it. Going for a 20/80 PG/VG ratio, they guarantee satisfying clouds of vapour with every pull on your vaping device. With many producers, this results in a less intense flavour experience, as the one tends to override the other. 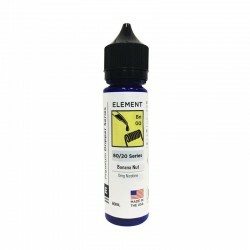 However, Element has neatly countered this by giving their juice a kick like a mule, enough to offset any reduction in potency and give you the best of both worlds. 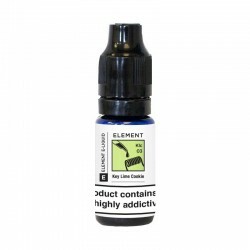 The Element Dripper series comes in 10ml pre-mixed bottles as standard, with a choice of either 3mg or 6mg nicotine, depending on your preferred strength of hit. For those of you that just want the flavour, or prefer to mix to your own strength, a nicotine-free version of the series is also available in 50ml short fill bottles. Our extensive range of Element Dripper e-liquids is available for you to buy today from the F&S E-Cig webstore, and comes with swift delivery to anywhere in the UK. Alternatively, you can visit one of F&S Central London-based stores, where they are bound to have the vape juice that’s just right for you.